Abrégé is the key word in this title and informs the reader that it serves as a summarised synopsis of a longer work. 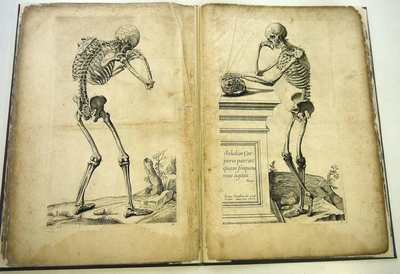 In this case it is an abridgement to the 16th century work of Vesalius, De Humani Corporis Fabrica Libri Septem (Basel 1543), perhaps one of the most influential anatomy books of the time. This 17th century Abrégé was actually produced by Roger de Piles who used the pseudonym Tortebat. Whilst working as the personal secretary to Michel Amelot de Gournay, the French Councillor of State, de Piles was imprisoned for four years in 1693 for his undercover involvement in confidential political missions using his work as a buyer for Louis XIV as a guise. Following his release he was appointed to the high honour of Conseiller Honoraire to the Académie Royale de Peinture et de Sculpture in 1699. Through adapting the original source material (Vesalius), de Piles was able to produce a book which aimed to facilitate and instruct artists wishing to accurately capture the human form.